Meet Ichijo Raku, the 15 year old son of a yakuza boss. His family is a "Family" in the truest sense of the word, but other than he appears to be a normal school kid. When he was five years old he made a promise to a girl he can no longer remember that he would marry her when they met again. To this day he wears a locket as a symbol of that promise and only the girl he made the promise to has the key to fit that locket. Of course, he could just forget that silly promise, but promises made when you are five years old are the real deal and you just don't break them. Everything sound pretty simple. Just find the girl with the key, right? This isn't real life, though. This is the anime world. In the anime world life is tough for a male main character. From the get-go his efforts to recover his childhood love are thwarted by a rival gangster outfit that threatens to cause an all-out war. Going to the mattresses seems inevitable. The bosses don't want a war so they propose a solution to bring peace between the two outfits. Granted, this isn't the kind of solution that Michael Corleone would propose, but the idea is that if the two children of the opposing sides were in a relationship there would be peace once again. Ichijo Raku now finds himself in a "false love" relationship with Kirisaki Chitoge, a girl with whom he had previously met under less than ideal circumstances. If the two can't manage the charade there will be blood in the streets. While it sounds like they have plenty of impetus to be a fake couple it also should be noted that they have to keep at it for three years. However, Raku will not be defeated so easily. He is dedicated to discover the one he made his childhood promise to even if it means he will end up sleeping with the fishes if he's caught being "unfaithful" by looking at other girls. Things get complicated further as he discovered that there are not one, not two, but three potential girls with keys to fit his locket. What we have here folks is a harem. Three girls have keys and childhood memories of some boy they can't quite remember. Raku only remembers one girl and one promise from his childhood, but can't remember a name or face for that girl. Enter: Conundrum Land. Occupancy: Raku. I can't remember anything from when I was five so I can't blame any of these characters. However, those lockets and keys must have been handed out like they were tic-tacs in Japan when these characters were younger. Romantic comedy types are only a genre because they milk the "will they, won't they" stage for as many laughs as can be had. Sometimes it works and sometimes it gets old quick. 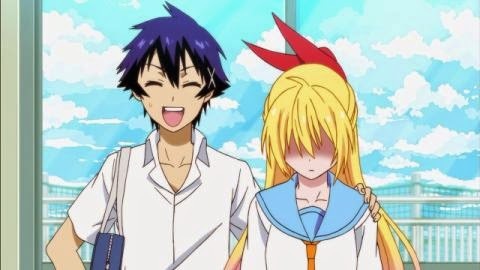 Everyone's mileage may vary, but I thought Nisekoi was especially hilarious. It also contained a hot springs episode as well as the obligatory beach episode in the first twenty episodes. Win. The first season was comprised of those same twenty episodes and while the answer to who has the key to his locket wasn't given it would seem there is still hope. A second season is currently airing. Of course, for all I know there could be eight more girls with keys introduced. This anime isn't exactly the most original of the bunch. In fact, there are a ton of cliches. But it is the way they are implemented that makes things fun. Raku is not a complete idiot and most of the main female characters have personalities and traits that would make it difficult to pick one over the other. Then there is always the idea that the locket and keys don't even really matter and everyone will agree to live and let live. Let's go for the harem ending, baby! Yeah!!!! In all seriousness, I would recommend this anime. It's an offer you can't refuse.